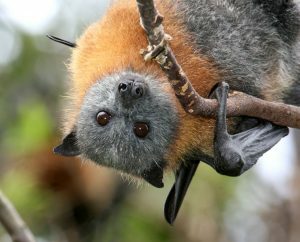 One of the largest bats in the world, the grey-headed flying fox, is found in the eastern parts of the Australian mainland. It falls under the ‘megabat’ category. Size: They are about 9.1-11.4 in (23.1-28.9 cm). Males are larger than females. Weight: They weight around 1.32-2.2 lb (600-1000 g). Wingspan: They have a wingspan of 3.3 ft (1 m). Forearm Length: The length of their forearms is around 5.4-7.1 ft (1.65-2.16 m). Color: Dark gray body, light gray head, reddish-brown fur around the neck, with the body fur extending down to the ankle. They live in the woodlands, swamps, and rainforests of Eastern Australia. Although seen at heights less than 650 ft, some have been observed at altitudes of 2300 ft as well. They are endemic to Australia, covering a vast area from Bundaberg and Mayborough in Queensland to the Victorian capital of Melbourne. However, their current range is believed to have shifted towards the south in the last few decades by around 465 miles to keep up with climate change. 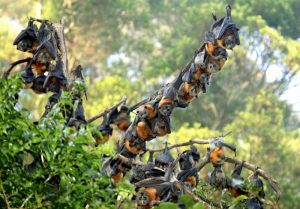 Grey-headed flying foxes are sociable in nature, congregating in ‘camps’ during the daytime, with one gathering comprising of about ten thousand individuals. Camps may even include conspecifics. They are nocturnal, setting out to forage during the evening, traveling long distances in search of food. 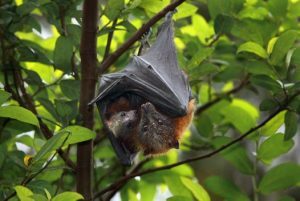 They rest by hanging upside down from the branch of a tree, or a similar structure, with their wings folded. 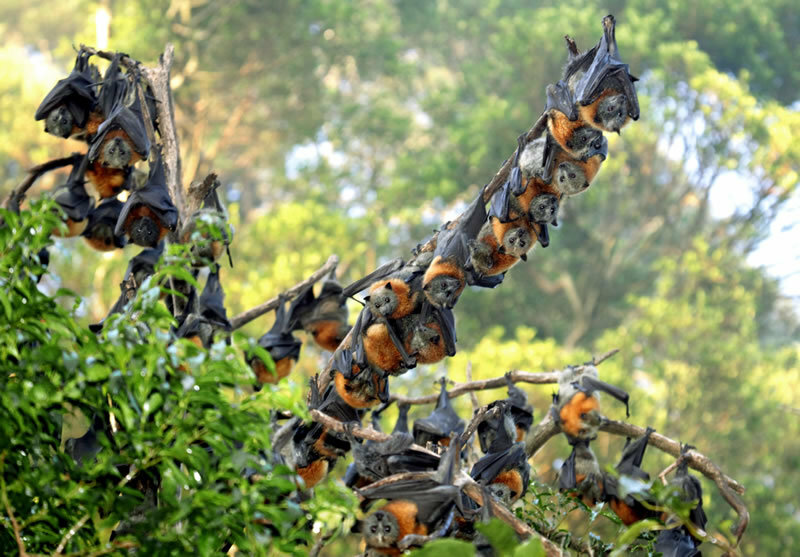 Grey-headed flying foxes migrate with the change of seasons, flying to locations where sufficient food is available. They are said to be territorial during the breeding season, with males marking their area using scents, as well as making loud calls to prevent other male intruders from entering into their space. Despite mating year-round, males are fertile during April and May, forming monogamous pairs. The gestation period lasts a little more than 6 months. Pups are born between October and November, needing their mother’s warmth after birth, clinging on to her for the initial three weeks when she goes foraging. They become quite independent as they are 3 months old, capable of foraging on its own, however, they are weaned until 6 months. They live for around 15 years in the wild. 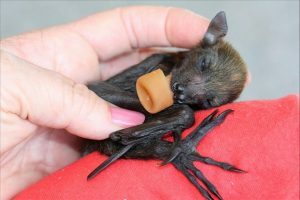 They are noisy creatures, using more than 20 known calls to communicate amongst each other, the sounds comprising of squeals and squeaks. Scent-marking communication is also common among them. Grey-headed flying foxes have a varied diet consisting of close to 187 plant species, from which they eat fruit, nectar, and pollen. They have a particular liking for eucalyptus. 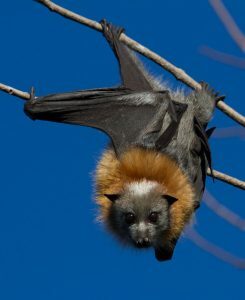 Since the grey-headed flying fox belongs to a family of bats that do not echolocate, they have exceptional senses vision and smell, helping them to understand their surroundings well and find food. 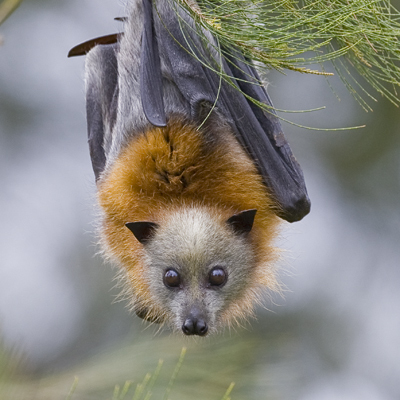 Scapular glands present on the shoulder produce scents that male grey-headed flying foxes use to mark their territories. They have exceptionally short tracts in their digestive system, helping the swallowed seeds to pass through the gut undigested within 15-35 minutes of consumption. 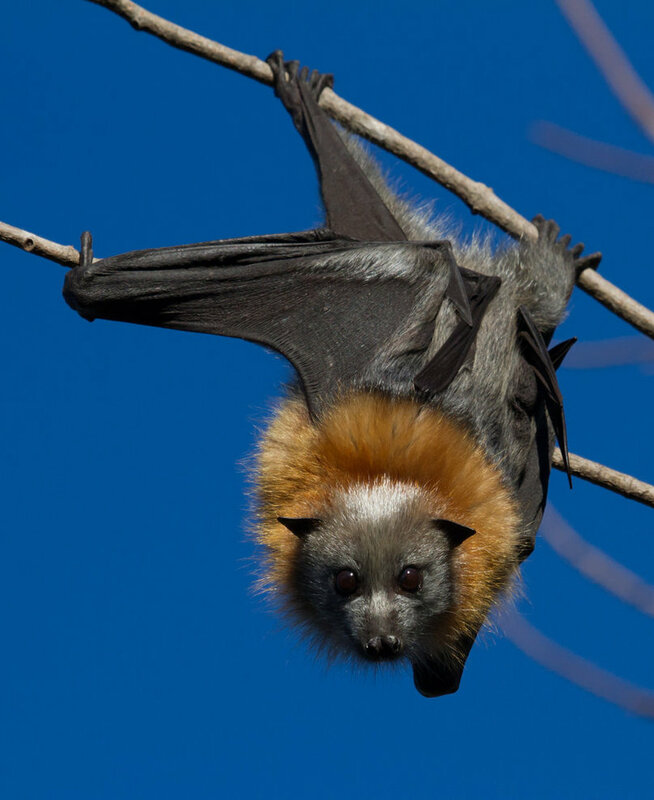 Eagles, snakes, goannas and crocodiles are known predators of the grey-headed flying fox. 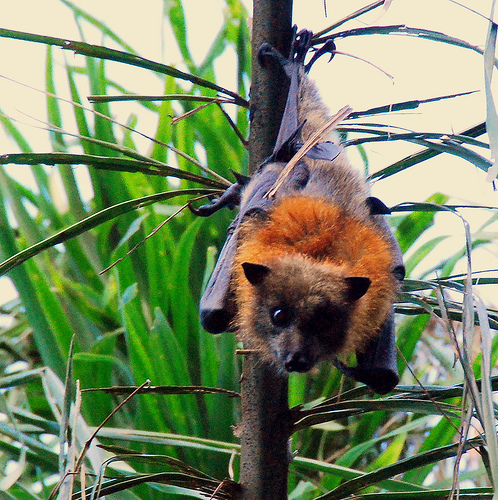 The IUCN Red List categorizes the grey-headed flying fox bat as ‘Vulnerable’. This categorization is mainly because of threats like the loss of habitat, climate changes and competition with another member of its genus, the black flying fox. The current population is estimated to be at 610,000. 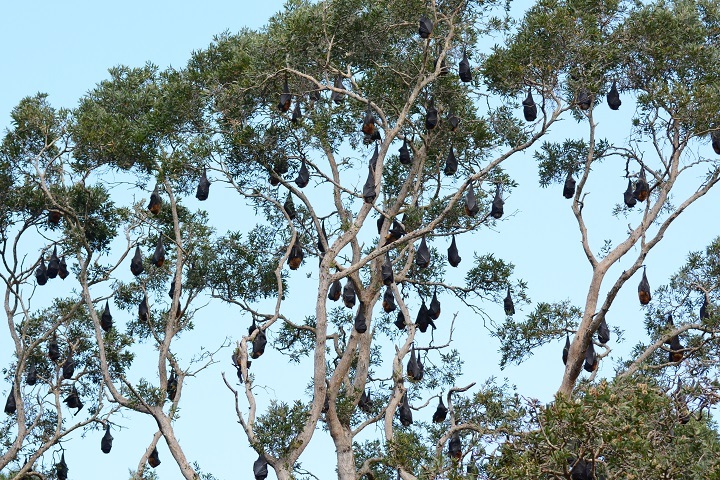 There are reports of grey-headed flying foxes surviving for 23 years in captivity. They act as pollinators because of their dietary habits and spread pollen across great distances.